★★★★★ Purchased this after my Keurig finally croaked. Decided not to waste money on another one. Purchased this ninja and so far very happy with it. Its easy to use, and the coffee taste better considering that actual coffee is used and not tiny pods. It also looks really pricey on my counter even though i got a great deal for it! The water reservoir can be easily removed and cleaned. There is an attachable frothier and you can also adjust the mug stand to allow for travel size mugs or smaller size ones. Theres also a drip tray feature that will allow you to lock the coffee pot from dripping coffee once the brew is complete. ★★☆☆☆ I purchased this because I like to make coffee for a travel mug and I also like espresso & cappuccino. One machine does it all. Except it doesn't. For regular coffee it has a size selector for a cup, mug, travel mug or Multi-Serve. None of these seem to actually make to correct amount. T fill my travel mug, I would have to brew coffee twice. Not quick or convenient. Trying to make espresso was a disaster. The first time it only gave me about a half shot in the cup. The next time it gave me about the same except it gave me a lot more all over the counter from over the sides of the coffee filter. After 5 days of messing with this, I gave it to goodwill. ★★★★☆ Its a coffee maker, very simple and easy to use. I like the removable water reservoir, the frother is excellent. A lot of features as far as cup sizes and cold brew options, although I rarely use anything but the full pot. The integrated coffee filter seems to work well and is a handy feature. The only hook I see is that it says it makes a better pot of coffee and all that means is that you use a lot more grinds to make a normal pot which in turn gives the coffee more "flavor". ★★★★★ Several years ago I owned a coffeeshop where we specialized in roasting our own beans. I've spent many years enjoying studying the nuances of a good cup of coffee. I've come to a place in my life where I fiddle less with fancy concoctions preferring instead to just brew a straight cup of coffee. Add to that that I've become a single empty-nester which means I don't need to brew in large quantities so I ditched my 14 cup brewer for a 5 cup but then I got caught up in the Keurig craze so I bought one of those and hated it. I never used pods (too much waste and sub-par coffee) and liked that I could brew one cup at a time but I hated the inability to brew consistently because there always seemed to be something wrong with the Keurig from being clogged to being inconsistent with serving sizes. I gave up on it and went back to my 5 cup brewer, but with that I always seemed to waste a little. In searching for a more perfect solution to my highly individualized needs and wants I discovered this new Ninja product. I have been using a Ninja blender every single day for years to mix up my morning smoothie. I've burned up many blenders including a very expensive VItamix but my Ninja just keeps going. Based on reliability of the brand with my blender I decided I might like to try the coffee system, but the price was too rich for my blood. I still wanted it but hesitated to spend even more money on my coffee habits. However, I ended up discovering a really good deal on a new in box model so I jumped and boy am I glad I did. I love this thing. It didn't take umpteen experimental cups to figure out how to manage it. It is made of quality construction. It brews an excellent cup of coffee and unlike some people who complain about the beep that signals when it's done brewing I don't find it that offensive. It's a pretty low-key beep. I haven't yet tried the frother though I'm sure I will, especially when my barista daughter visits. The one thing I do wish I had is the ability to brew an entire pot if I take the notion, say I have company. I know Ninja has a similar model that includes a several cup pot but that one wasn't on sale. It's okay though. It's a very rare occasion I have enough coffee drinkers in my house to warrant brewing an entire pot. What I love about it most is that I can easily brew a single cup of coffee without having to use pods and without having to battle the tiny brew basket one must use in order to avoid using pods in a Keurig. I love that it offers me several options in terms of size and brew strength. I also really like the little measuring spoon that attaches to the side of the unit. Very handy. This unit is a dandy and I think I might have finally found my last coffee maker. 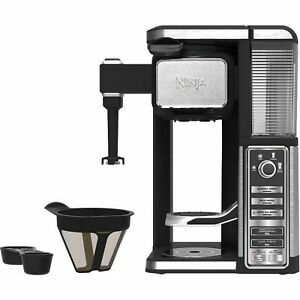 ★★★★★ It was an easy set up, makes a good cup of coffee with lots of features. Looks nice on the counter also love the no pod concept, I can choose my own brand without having to purchase expensive pods.